Here are some more Xindi ships for those that love Star Trek. It’s lunch time and am posting these fast for your viewing pleasure!!!! In this set, the script called for an aquatic vessel that is basically a giant flying aquarium. The ship itself is full of water and the sea faring Xindi operate this vessel just like Shamu does tricks at Sea World. 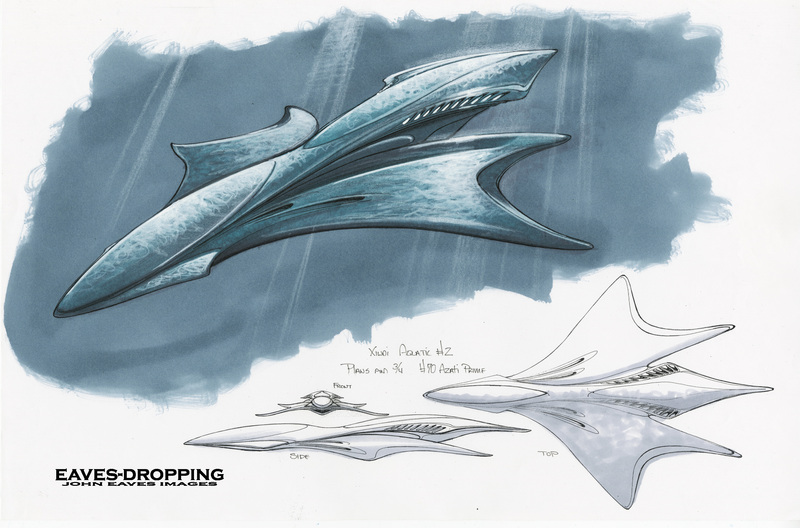 One of the main designing points that had to be drawn were the use of multiple windows for VFX shots of the Xindi swimming by and, when the ship gets hit hard, hull ruptures would expel liquid and Xindi out into space. So with that here is the sketch process that came together and the final drawing was the one that got the gold star!!! WOOOO HOOOO! Sorry it is low res and a bit grainy!!! and the final and my fav version! here is the rejected Xindi bomb structure which also shows the now rejected Xindi aquatic ship! That´s one of the few things I liked about season three. That ship is probably the closest we ever got to a real Trek submarine (not counting the Delta Flyer incident). Was the nod to Seaquest´s bow section deliberate or subconscious? Cool post, sorry if this sounds dumb, I remember seeing the final ship in space and when the battle before earth occurs the ship ruptures and the water breaks out into speace. I got the sense from your description these gigantic were also used underwater? like a sub? So it is both a sub and a spacecraft combined, was that the intent? Thats kinda new to Trek. it was used for both and the rational was that it would act like a pressurized cabin when under water like our jetliners are pressurized. I was very impressed when I first saw the aquatic’s vessel – so the final one is cool work though. 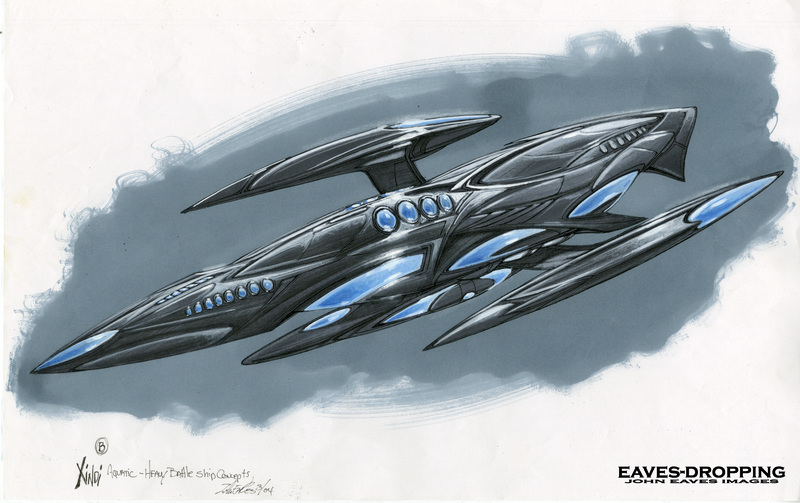 But the first one, the filler, is just what I would expact a xindi submarine/space ship to be!! Without this blog I would never had the chance to see it – Thanks!!! Beautiful work John – thank you for posting these. 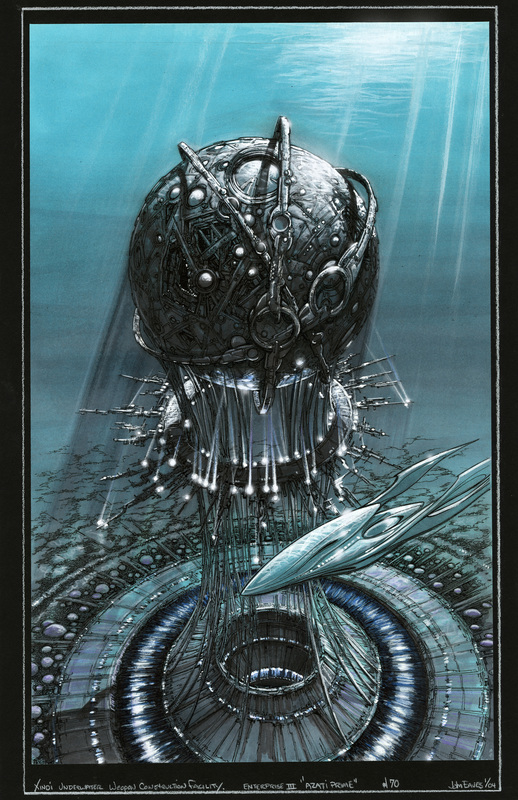 I thought the whole concept of a starship filled with water was pretty cool. I love that Xindi bomb structure picture – that one should be in your portfolio. M Max, I agree…I like that first one, too. I would have liked to see more of it, but either that or the final would have been my choice. WOW what is this new clickable feature!!! I never saw this before and you really do get to get in close!!!! glad you liked it and this would take a few hours to color from the penned drawing. I’d love to ask you some questions about this stuff, wish I could just pull up a chair! Loved that ship, I’ll admit, when the glass cracked and all that water started flushing into space, it felt so much more tragic than any other ships demise, it really gave me gut this sad hollow feeling. That really was a great episode I must admit, infact I really loved how the Xindi storyline arc introduced so many new designs to the series. My only regret is that we never really got to see the Ent-J properly. I too like the final version best. Although the manta would have been cool too. We have seen a similar ship in VOY: “Thirty Days”, likewise meant to operate under water and in space. I would say these are all strong designs. As always, thanks for sharing this art. The final Xindi-aquatic ship turned out to be gigantic. 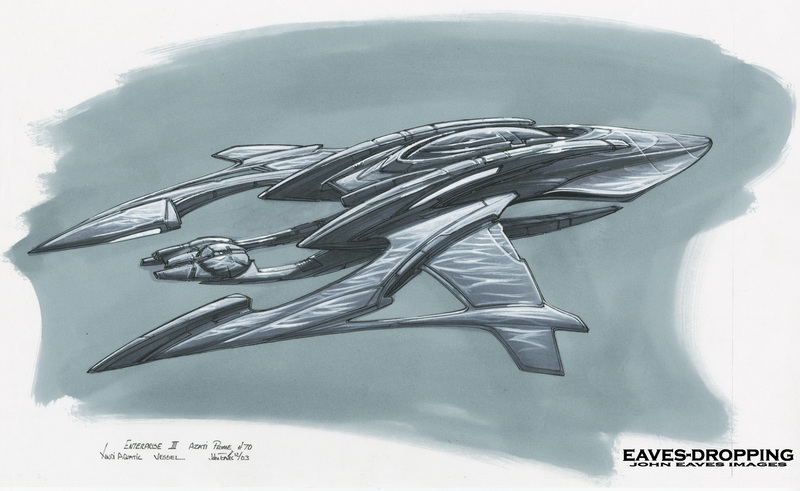 There was a smaller type of Xindi vessel with shapes and colors similar to the large ship, but it was never really seen close up. 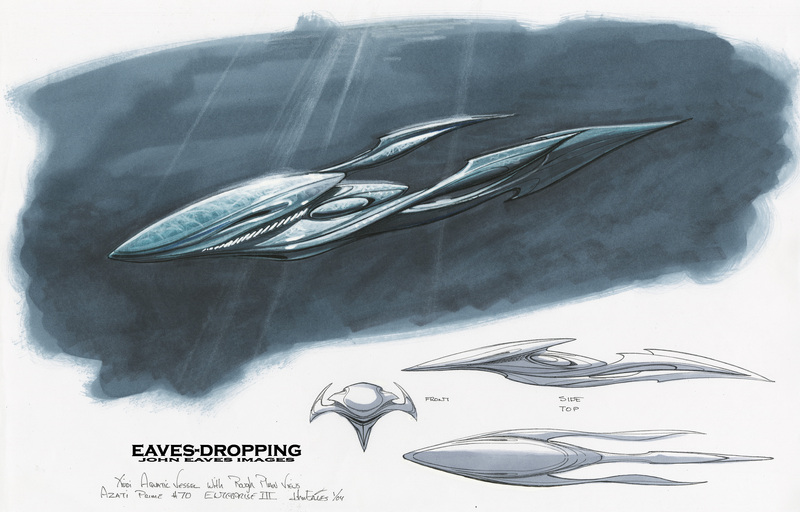 It bears a certain resemblance to the drawing labeled “baby flipper/manta ray version.” I wonder if we will ever get a closer look at it. Very nice I kinda like all 4 versions though if I had to pick one I’d go with the 3rd pass. Wow another great Xindi post ! I really liked the third season of Enterprise, and the ships only made it better. Apart from the “earth-based” one, I love all of them ! 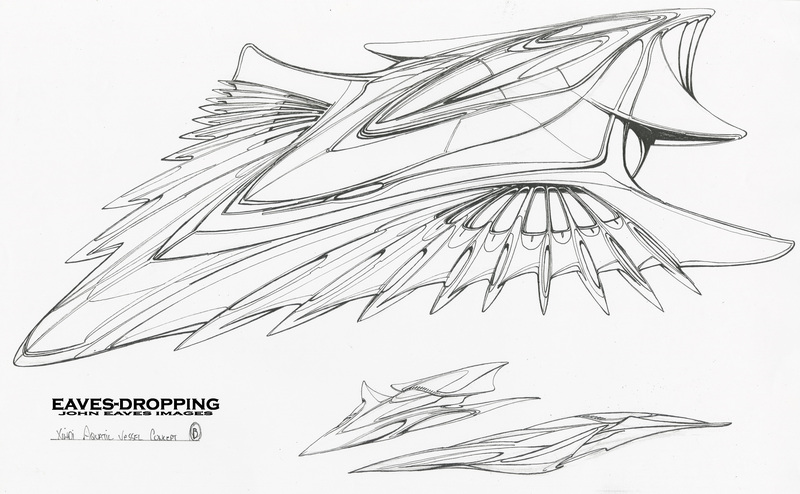 The final version actually reminds me of the Klingon Bird of Prey or Raptor from Enterprise but only a little bit. 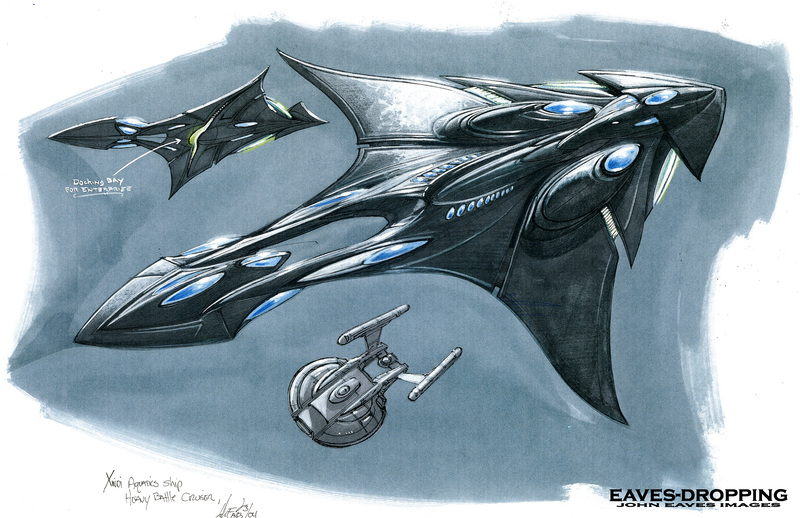 I love the final version and would love to have seen it more in Enterprise. Such a cool design. Aren’t you in class, Mr. Eaves? The conch shell one looks vicious! Love all the Xindi designs. The aquatics was really nicely done, especially the explosion. All the concepts would have been great, but I love the final design. Very graceful, but powerful looking, which suits the aquatics. And as others have said, the explosion was really well done.